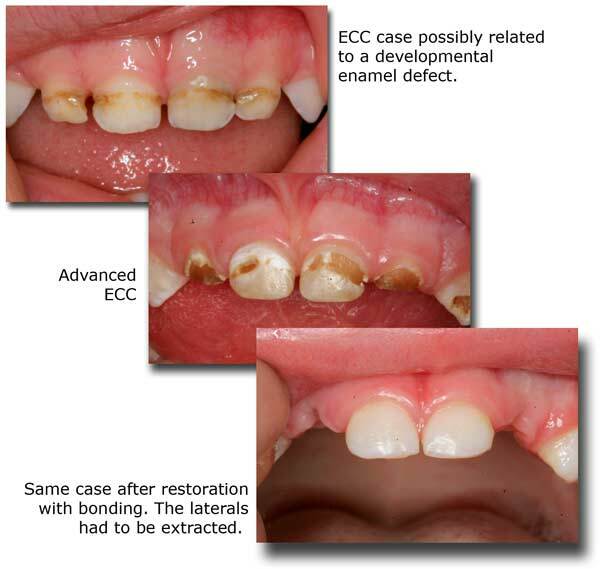 Early Childhood Caries (ECC), or previously known as “bottle decay” is a phenomenon still poorly understood, but pretty widespread. Many parents notice their 2-4 year olds developing widespread cavities on their front teeth, in spite of the fact that they may be extremely cautious with their diet and oral hygiene. In the past it was associated with babies sucking on their formula milk bottle in bed and going to sleep with it, thus creating an environment for the decay-causing bacteria to thrive on the pooled and fermenting milk on the surface of their teeth. Nowadays there seem to be other aggravating factors, and thorough attention has to be given by parents to keep the teeth clean from the bacteria that cause this condition. Diet, proper oral hygiene, Xylitol gels, some homeopathic remedies, and proactive dentistry can all be used to prevent or slow down this condition. Even though recent accounts maintain that breastfeeding is not associated with a higher risk for early childhood caries (ECC), we see, however, in our practice a high incidence of ECC in breast-fed children ages 2-4, ironically children of very healthy and diet-conscious parents. This is especially pronounced in cases where nursing is carried out into and throughout the night. We therefore urge mothers to stop nighttime nursing and step up tooth cleaning methods using gauze and xylitol before the child goes to sleep. Other independent associations with increased risk for early childhood caries in the literature are rather older child age, poverty, and maternal prenatal smoking. Some ethnic groups are also independently associated with severe early childhood caries. It is appropriate to state here that in primitive and indigenous cultures with primitive diets, the incidence of childhood and adult decay, periodontal disease and tooth crowding practically did not exist, according to the unequaled anthropological research done by Weston Price).